Hugo Chávez died of cancer yesterday. He has been a big influence on our thinking. Although Bunny and I have never been to Venezuela - or anywhere else in South America for that matter - we have been trying our best to study about resistance to U.S. imperialism in that part of the world for several years. I still hope to go there one day to see with my eyes what is happening there. May you rest in peace, Mr. Chávez. Added on February 1, 2013 by Drittens Cat. Bunny died on Friday afternoon, January 25. It's still hard for me to think of what to write, but I want to write something for all of you who have been in contact with us, providing Bunny with so many kind words of support and encouragement. I want to share with all of you how Bunny died, because she died magnificently. As some of you may know Bunny had a lot of physical problems these past few years - first arthritis, then diabetes, and then about a year and a half ago she also found out that she has cancer. She did traditional Chinese medicine and even chemotherapy for a while, but finally decided to stop all her treatment when the doctor told her she also found (via ultrasound) a rapidly growing tumor in her main artery and that it was already obstructing about 90% of the blood-flow from her heart to her body. Shortly after that she survived a severe episode of congestive heart failure. The emergency room doctor told us she had no time left, that death could come at any moment. This was over six months ago. When we found out Bunny had cancer I just cried and cried, but she said to me, "Don't be afraid. I'm going to show you how to die." Bunny was calm until the very end. Even as her body became weaker - "wasting away" the doctors called it - her spirit seemed to steadily become larger and more powerful. There were so many times that Bunny was in a lot of discomfort or pain but she never complained even once. She was so strong. We spent the last few months enjoying every moment together, working as hard as possible. Now everything is in order, and the Pinky Show can continue, even without Bunny. Three days before she died she began fasting - no food or water. I made a soft bed for her in a cardboard box and she laid down in it, and for the last three days she didn't move much. I told her everything I wanted to say. She didn't say anything. And when she was ready, she left. She left so quietly for a moment I wasn't sure if she was gone or if she was just sleeping. As always, she did everything exactly the way she wanted. Looking back I guess I can see now that Bunny had been preparing for death her whole life. Sometimes she'd say, "We come into this life alone and we will leave alone." I used to feel a little bit lonely and afraid when she'd say things like that. But now she's gone and I am realizing that she wasn't trying to make me afraid, she was just trying to move me towards preparing for death too. I wish she had told me exactly how to die, or how to face death without fear. When I realize how far away I am from understanding these things, and how much suffering she endured, I think Bunny made herself into a good example because she loved us so much. Kim and I covered Bunny in a blanket and we took her in the box to her doctor, Dr. Wendy, who took care of Bunny's cremation. A few days later we got a telephone call that we could return to pick up Bunny's ashes. When we got there we were shocked to see that they had put Bunny in a tiny metal can. Bunny used to be so big, now she is in a little can. Somehow I don't like it, I think when I am feeling stronger I will try to find something better to put Bunny in. It's so quiet around here now. I find myself feeling sad and missing her so much, but when I think about how she lived and died, I feel nothing but happiness and respect for her, my friend. Added on January 21, 2013 by Drittens Cat. Bunny crocheted this doll for Wheelchair Lady, who sleeps with it every night. This cat's had lots and lots of names already, because Wheelchair Lady's short term memory isn't so good, so almost everyday she gives her a new name. It's cute because the nurses at the hospital, when they make WL's bed in the morning sometimes they rest this cat's head on the pillow and pull the blanket up over her to make her look very comfortable. This way when WL gets back to her bed at night she's happy that this cat looks like she's waiting for her in the bed. I'll try to photograph & share whatever new things we make around here. PS welcome Myles to Earth. Added on January 17, 2013 by Drittens Cat. I thought I posted this earlier but somehow managed to lose this entry in my desktop clutter. This past October 1st our very good friends had a kitten. They asked Bunny and me to name him. We suggested the name Myles, to honor Myles Horton. So his name is Myles. He's now 3 2/3 months old and super cute. Side story: When Bunny and I were trying to think of names we like, we realized that practically all of our heros have spent time in prison. Some of them spent a LONG time in prison - some of them are actually still in prison, and some of them even ended up dying in prison. It's sad to think about, but such a concrete reminder of the price sometimes paid for speaking truth to power. Anyway, I wanted to show you this toy Bunny crocheted for Myles. It's wool yarn stuffed with wool roving and it's about 7 inches tall. And yes, that's a cape she's wearing. 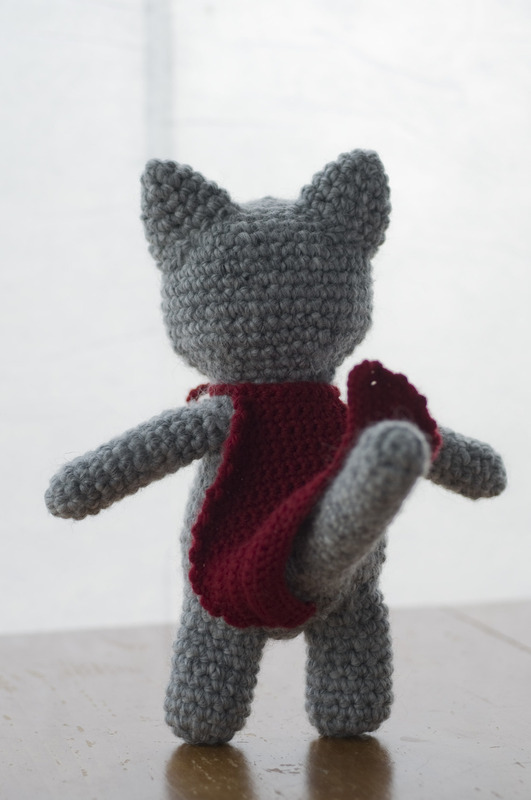 For some reason Bunny decided to crochet a cape for this cat. Whoops, the "new year" part already zoomed by. Added on January 16, 2013 by Drittens Cat. Wow, I feel like I blinked and suddenly 2+ weeks of 2013 has already disappeared. One of my new year resolutions is to consistently make entries here in our project diary, so I am already kind of flopping on this one. (I will try harder.) Bunny and I have been working day and night on the new Pinky Show website, the new PS online store, the new project and also the new project's store. A few people e-mailed us after my last entry asking us what our new "secret project" is. It's actually not a secret at all so I'll talk about it a bit now. To make a looong story short, we want the Pinky Show to be financially stable and we've decided to make and sell objects as a means to achieve that. Bunny had the idea that she wanted to make "nice leather wallets" and bags. (I put that in quotes because personally I think anything made out of leather by definition can't be nice - they're gross! Have you seen how leather is made?) So anyway since I don't like harming animals Bunny finally agreed to develop wallets and stuff that are not made of animal parts. We found a very nice substitute material that functions very similarly to leather but the good thing is you don't have to kill a cow in order to make a bunch of wallets. The material also doesn't require a lot of harmful chemicals and water to produce, so it's far friendlier to the environment than anything else we've been able to find. Anyway, Bunny and I have been making lots of drawings and prototypes the past few months. This is a very early pattern we were working out with paper. We're trying to keep all of our designs as compact and minimal as possible. Designing useful objects is a lot of fun!